Stars in "PIRATES OF THE CARIBBEAN". 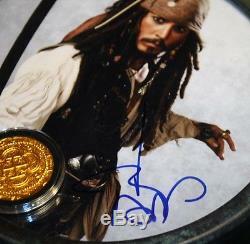 JOHNNY DEPP Signed PIRATE Disney Prop COIN, DVD, UACC. A Great Gift or Investment! 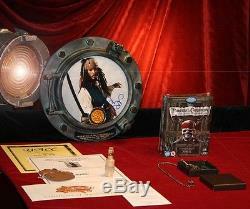 This particular JOHNNY DEPP "PIRATES" collection includes. 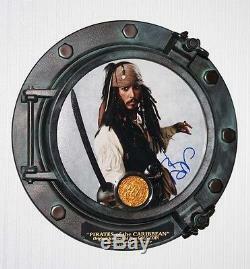 A Genuine Original JOHNNY DEPP Signed Autographed PHOTO in a Large Port Hole Display FRAME & Engraved Plaque + COA. 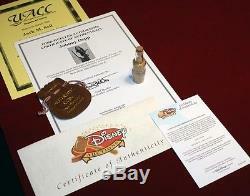 A Screen-Used Original Prop Treasure GOLD COIN from "PIRATES Of The CARIBBEAN: The Curse of the Black Pearl" + a copy of the DISNEY Certificate Of Authenticity & original DISNEY BAG. 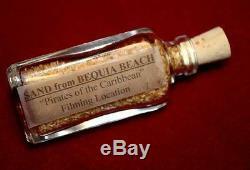 A Vial of actual SAND from BEQUIA BEACH, where Johnny Depp filmed parts of this movie! 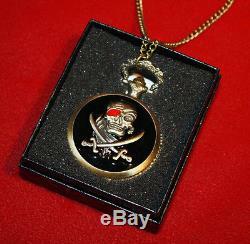 A beautiful "Pirates" gold tone POCKET WATCH in Black Custom BOX. ALL 4 Sealed BLU RAY DVD's of these classic movies & MORE! This case is mounted to the frame and can be opened if you like without damage.. 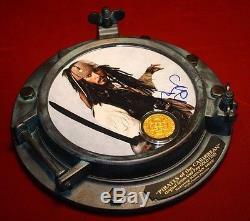 The fantastic genuine PROP "Pirates of the Caribbean" Screen-Used GOLD COIN that came directly from the set at Disney Studios includes the official DISNEY Coin BAG.. And a copy of the original DISNEY CERTIFICATE OF AUTHENTICITY that guarantees this original prop gold coin screen-used & genuine. The frame is made of strong injectable molded plastic and given an aged antique look with the paint used on the frame. The original Autograph measures approximately 8 Diameter and is a Color photo that was signed in permanent Blue ink marker. His signature was signed in person and is guaranteed genuine by a UACC Registered Dealer and includes the original Certificate of Authenticity! The frame is a Large, Dimensional Port Hole design with this engraved plaque that reads. 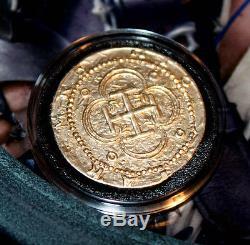 PIRATES OF THE CARIBBEAN, Original Screen-Used Prop COIN, Starring JOHNNY DEPP, Walt Disney Pictures. The overall unusual frame measures approximately 12 diameter.. And is ready to hang on the wall of your Media Room, Office or Museum! You also receive this SAND from the Island of Bequia where Johnny Depp filmed parts of the movie! This Vial of ACTUAL Real SAND was collected from the Beach at BEQUIA that comes stored & labeled in this nice glass vial.. The Beach in BEQUIA was one of the beautiful filming locations used in the early Pirate movies.. This could actually be sand that Johnny Depp ("Jack Sparrow") himself walked on during the filming of these great movies! You also get this new, beautiful "Pirates" collectible POCKET WATCH... The Gold tone watch is embossed on the back with the 3-D Pirate LOGO.. The face of the watch is perfect, runs on a battery & has a long watch Chain.. This Watch is really elegant, ready to use or display.. This new electric Pocket Watch comes in this nice watch BOX! You also get Four BLU RAY DVD's of these classic films so you can see your prop on the screen! 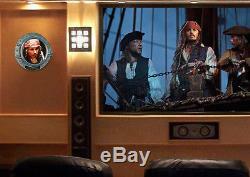 PIRATES Of The CARIBBEAN: "The Curse of the Black Pearl, " "Dead Man's Chest, " "At World's End" & On Stranger Tides. You also get all these extras! All DVD's are WS, Region ONE Format... AND, you can get these 4 movies in REGULAR NTSC DVD's if you don't need the Blu Ray Set, just by asking! The original Prop Pirate COIN & AUTOGRAPH have been stored in an acid free case in a smoke free, pet free environment since being acquired. 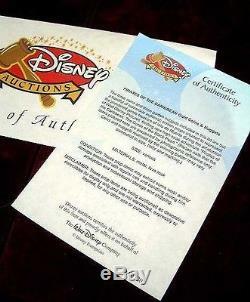 The original Johnny Depp Signature is guaranteed for life by a UACC Registered Dealer and includes the original DISNEY AUTHENTICATED Coin BAG and a copy of the original DISNEY STUDIOS CERTIFICATE OF AUTHENTICITY that guarantees this Prop Genuine... Any Buyers from outside the U. These photos are included as our ad description. Check out our other auctions for more TV & Movie Collections that include wardrobes, props & autographs. Sell is a Registered Dealer with the U. We are proud that some of our memorabilia is on display in the SMITHSONIAN, Washington, D.
Btbandabbermake3s PRAISE: Fantastic items, 30 Star Movie Maker! Heimdell51 "PRAISE: "Great guy; very prompt & efficient service & exc. Packaging; got a free bonus too! Austinpowheinybeer PRAISE: GREAT GREAT GREAT!! Toothfella PRAISE: Thanks for the super helmet Jack! Hope to do business again. Jimsoden PRAISE:Great packing, good emails, very generous with his time and effort, class act!!! Circus10 PRAISE: Fabulous costume, vintage RBBB. Belfast PRAISE: Wonderful Ebayer & with genuine COA's too! It is the most professional-quality work I've ever seen, absolutely worth every penny. I can't thank you enough for helping me to realize my dream of being able to hold in my hand something that was actually a part of this movie. I even cried a little when I touched the prop for the first time. Thank you from the bottom of my heart. I hope to do business with you again some day! Bonnie emailed this photo from her BED & BREAKFAST after she received her JOHNNY DEPP order. Everyone that sees it says the same thing, Oh My Goodness. I will treasure it always. Here are a couple of pictures taken in our master suite. This entrance is to our 2 level bathroom. Johnny has a special spot on the inside arch. It is drop dead gorgeous. We also have a booking for the whole weekend with a couple from Texas, so I will enjoy showing it off! I PUT YOU IN ONE OF MY FAVORITES! And Tina wrote this about her Johnny Depp display & our layaway plan. You should have seen me, my hands were shaking and I was teary eyed. This is by far, the most precious item I own and I will keep it FOREVER. A real "One of a Kind" Find & Conversation Pieces.... Movie & Television Props & Autographs can make for a good investment as well! Check out our other auctions for more great movie & television shows PROPS, AUTOGRAPHS & COSTUMES! Imagine giving this great PIRATES OF THE CARIBBEAN movie collection to the JOHNNY DEPP Fan in your life or just keeping it for yourself for what should be a good investment! 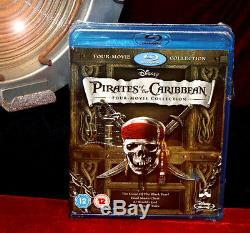 A GREAT MOTION PICTURE COLLECTION from these classic films, PIRATES OF THE CARIBBEAN. VERY RARE & VALUABLE "One Of A Kind" PROP & Original AUTOGRAPH!! This would look great hanging on your wall! Add a map to your own listings. 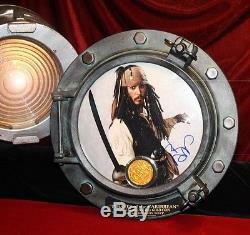 The item "JOHNNY DEPP Signed PIRATES OF CARIBBEAN, DISNEY PROP Coin, Porthole COA DVD UACC" is in sale since Monday, May 7, 2018.